Today, August 30, 2007 is the second annual No Screen Day, started by Hannah Skaggs in 2006. Then 8 years old, this Windward Adventist student realised that reading and other non-screen activities such as playing sports, talking, cooking dinner, or even looking at the clouds with a friend, make us happier, healthier, more connected humans. Last year Hannah publicized her event at schools around O`ahu, offering gift-card incentives to spark children’s desire to abstain from their screens. It’s not only video games that Skaggs wants people everywhere to give a rest (the 2006 No Screen Day saw participants in Hawaii, the west coast, and Canada and she hopes it will go global), but all devices with screens, including games on cell phones, computers and television. It’s not about condemning these activities flawed entertainments, but more positively about motivating and creating a population of active kids and adults. This year, Governor Lingle agrees: she and Lt. 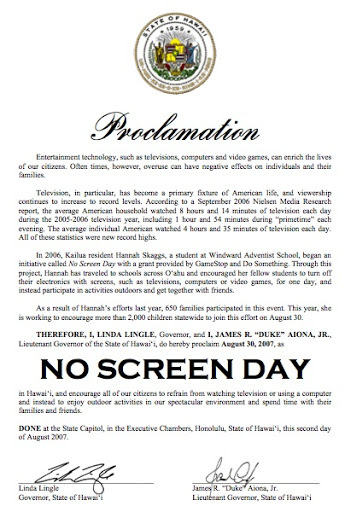 Governor Duke Aiona have proclaimed August 30, 2007 NO SCREEN DAY. So today, whether you’re in Hawai`i, on the mainland, or any other country or city–turn off those screens and support a young girl’s vision. Maybe just this one day will help create more visionaries–young and old. I earned my masters degree there–a very simple reason that nonetheless took me halfway round the world. Raiatea Helm is a great local talent–she’s on my list of people to interview for WIMR. Great! 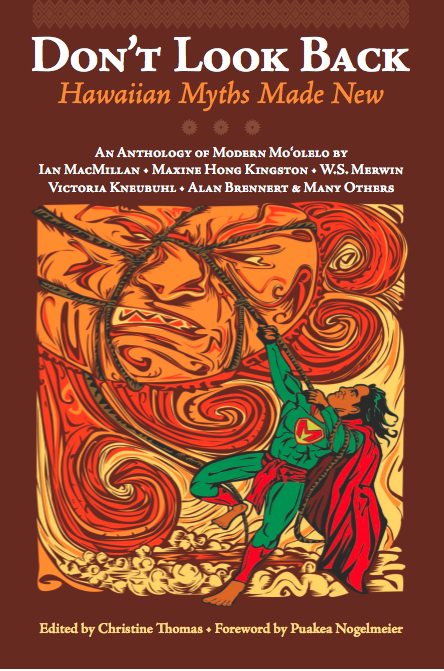 Thanks for reading LL and the articles. One month on Moloka`i sounds great (I’ve only spent a week), and I think that’s one of the best things about online newspapers, is being able to connect with another place after you’ve left. I do that often to stay connected to London now that I no longer live there.